Everything Changes – The Guide to Young Adult Cancer » Do You Work When You Are Sick? 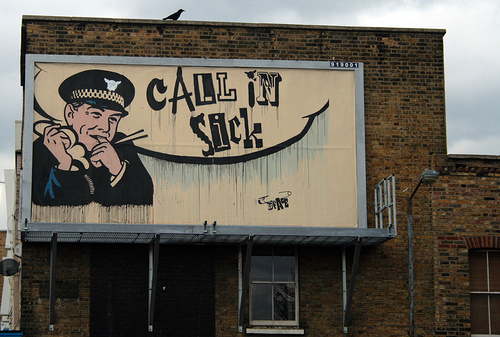 Do You Work When You Are Sick? I’m under the weather today. Trying to get comfy in bed with a fever on a hot summer day. Trying to peel myself away from my computer and my workaholic tendencies. Trying to take catnaps while reading Unaccustomed Earth – Jhumpa Lahiri’s most recent collection of short stories. Wondering on days like today why I don’t have a TV. I’d love some Law and Order right about now. I can hear kids playing in a fountain in the park next to my apartment building. As a kid, I grew up next to a private elementary school. When I was home sick, I remember hearing the school kids playing during recess. I always thought “Ha, I have the day off of school and youuuu doooon’t!” Maybe I will try to adopt that attitude today. I’ll think of all my friends slaving away at work while I get to chill in bed reading fiction instead. If I spent the afternoon working, I’d complete an interview and put some hours into promoting my upcoming book reading. So instead, I’m going to crank out a little blog post about it and call it a day. Am I the only one? Do you guys ever have a hard time prying yourself away from work when you don’t feel well? Are you addicted to feeling productive? I’m damn lucky that I am self-employed and can manage my own schedule. Have you had to work during your illness because you didn’t have sick days or disability leave? 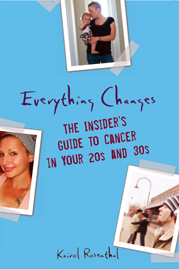 Find out more about Mary Ann and other young adults who decided to collect disability during and after treatment – Read Everything Changes: The Insider’s Guide to Cancer in Your 20s and 30s. I was in a rare instance of ‘having’ to continue working or lose my insurance. It was a difficult decision, but one I had to maintain to help keep the drip of chemo, food on the table and a roof over our heads. Nothing like getting a drip in one arm and maintaining mouse clicks as I engineered my way though my work simultaneously. It didn’t help though since eventually my work became known as ‘chemo code’ instead of ‘g-code’! You should have seen the look on the faces of both my nurses and fellow chemo drinkers. They thought I was insane! On Chemo infusion days i would still work. It was fine though cuz i bartended at a Mexican joint and if I puked people thought it was just authentic ambiance. I just told them not to drink the water in the best Hollywood sterotype voice my limited latino genes could muster. What I find unfortunate is the difficulty patient care workers have in not always being able to call off when they are sick and infectious. Especially today with the workforce shortage and poor staffing there is often no one to cover patient care if someone can’t cover their shift due to illness. Hope you feel better soon kiddo and I hope it ain’t the Aardvark flu or whatever they said that new flu was. I worked throughout my treatment. I went to radiation every morning before work and worked half days every Friday before chemo. I worked for two reasons. The first was I am a single young adult and I needed the salary and benefits. The second was I needed the distraction. I felt the alternative was sitting at home, twiddling my thumbs and feeling sorry for myself. Sometimes I wish I had not pushed myself so hard during treatment, but ultimately I am glad I kept working. I always work when I’m sick, whether that means working from an inpatient bed or when I’m stuck home on the couch with pneumonia. If I can sit up, great; if no, I rest my laptop on my chest while lying down and type that way. I can’t always physically make it to class when I am really sick, but I don’t cancel them, I hold them online. Aside from teaching, writing/editing is a good fit b/c I can do it from a hospital bed. Of course, the downside is that when you’re your own boss and need to keep the income stream coming, you can’t totally switch off and have a real sick day–if you’re not working now, you’re not getting paid later. Part of it is I like to remain productive so sickness doesn’t define my career. Part of it is also that I am just used to it–when I was a kid I always missed tons of school but caught up on my own at home, so it’s just normal to me. Thanks for all of your comments. I know people who get disability and decided not to taken even though maybe they physically should. I know others who need and want it and have no access to it. How unfair, how perverse the way the system works. During cancer treatment I thought I could receive no disability because I had worked menial under the table jobs all of my life. Then I learned I was entitled to California State disability because I had been working a part-time above table job in that state for a short time before my diagnosis. In the stories I heard while interviewing people for my book, so very much hinged on the word ACCESS. It completely changes the illness experience. Here’s to you all who need or needed a rest and couldn’t get it! When I was “healthy” I used to take sick days when I probably could have gone to the office. Now when my illness is chronic I have such a strong aversion (guilty feeling?) to taking sick days even when I really should be at home resting. I even went to the office during a snowstorm this past winter – only to find 95% of the office people missing! I think I just don’t like to be seen as “sickly” “wimpy” and overcompensate. I know it’s stupid to be so paranoid. It wasn’t even like I was a workaholic before. Its definitely my insecurity.I’m probably also trying to unconsciously accumulate as many sick days as possible for when if I ever need an extended period of medical leave in the future. Kairol, we must be twins – I don’t have a TV and just started reading the same book – LOL. Take good care hope you feel better soon. Great issue raised by Anon Me Again: I’d love to know: Does anyone else go to work when they are sick because they don’t want to be perceived as sickly or weak or wimpy? And yes, we’ll have to have a mini-book club discussion, you and I. I’m on the 4th story. Yep. Even now, when I got to NYC every three months for followups, I take a vacation day or work while in NYC in the MSKCC waiting room. At work, I feel guilty for taking a lunch or running an errand, and I worked really hard all through chemo and treatments to keep doc visits and followups off of the days when I was supposed to be working on site. To be fair, in the beginning I felt no guilt–and work was great. My bosses ordered me a laptop and a company modem and had broadband intalled at home so that I didn’t have to drive in during infusions. But now that I’m back to being NED, I feel this weird need to *be* on site, as often as possible. We’re on swine flu precautions at work–no one with active coughing is supposed to be at work. And I got this cold last month that owuldn’t go away. I stayed home three days…but worked from home. Those are the first sick days I’ve taken in years, but I couldn’t just relax and keep my germs at home and take a real sick day to rest and recover.